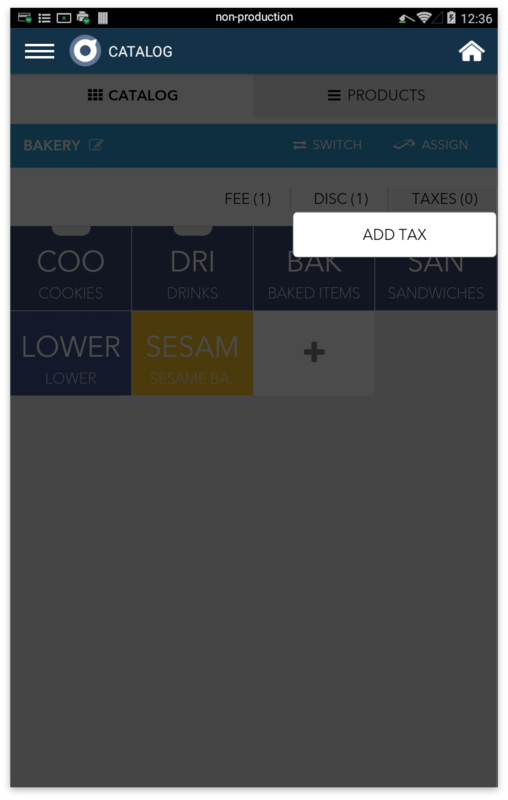 Within the Catalog app, a merchant may create taxes, discounts, and fees associated with that unique catalog. 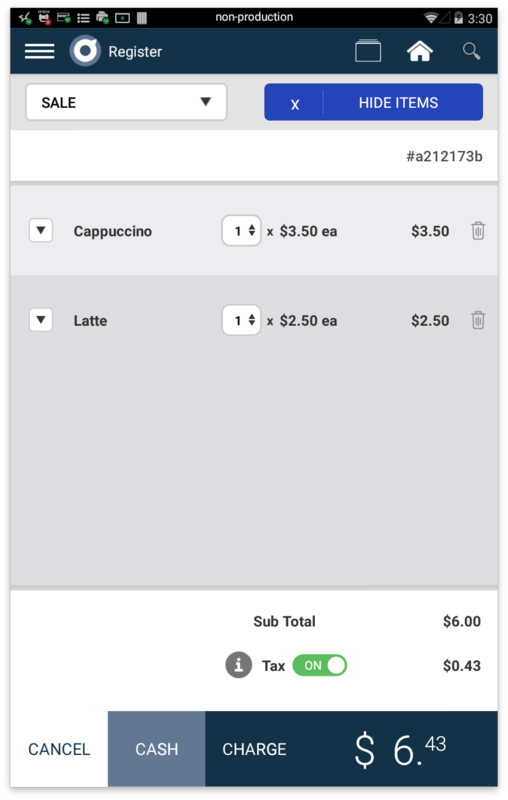 When that particular catalog is assigned to that terminal, these may be applied to an individual item or to the entire order within the Register app. Predefining the discount and fee buttons allow you to quickly and easily apply discounts or fees on items or orders. 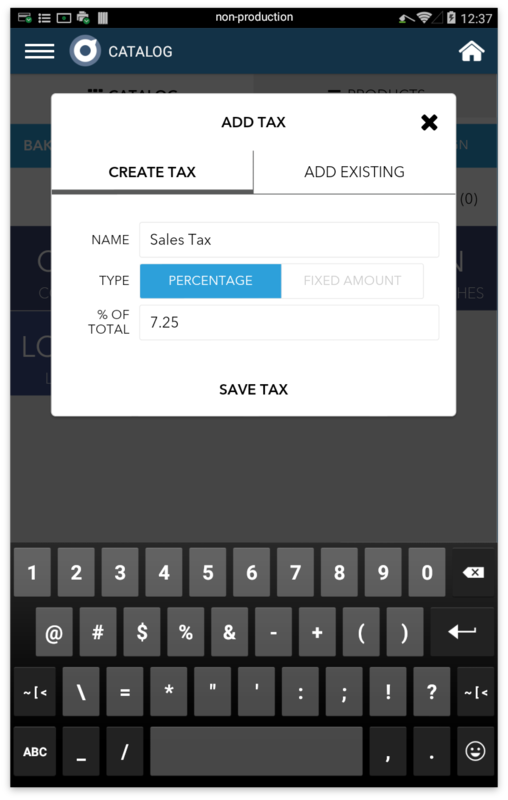 Predefining taxes allows the Register app to automatically calculate taxes for the taxable item or for the entire transaction. This may be done prior to the sale on the Catalog on the Terminal or on the Merchant HQ web portal. 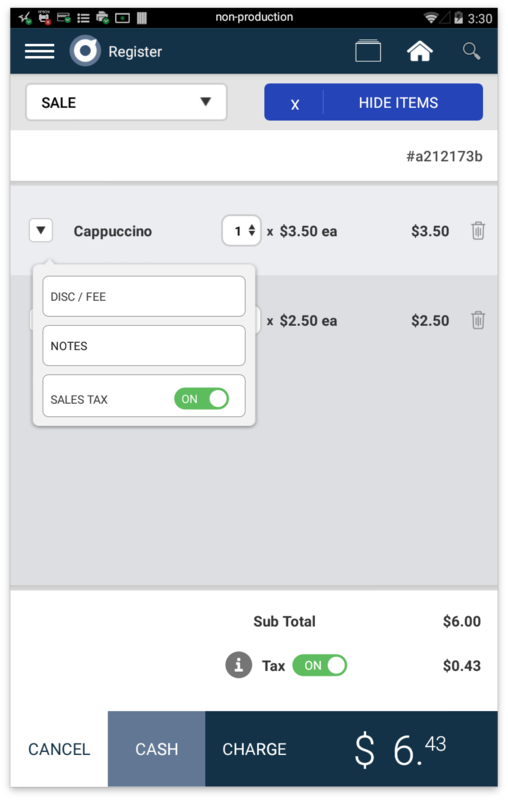 You may also create custom discounts and fees in the Register app. We'll cover the process of creating and applying each in this article. When you first enter the Catalog app, you’ll see Categories displayed on the tiles. The row just above the Category tiles will display "Tax", "Discount", or "Fee". Any taxes, discounts, or fees created here will be applied at the Order Level. To create taxes, discounts, or fees to apply at the item level, you must select which Category you’d like it to apply to. 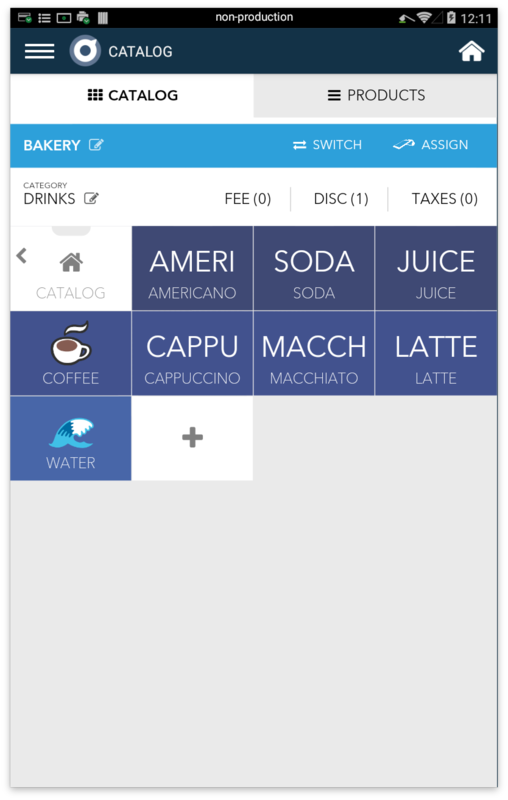 In Catalog app, select a Category: ex.“Drinks”. Any taxes, discounts, and fees created from the row above the product tiles will be applicable at the Item Level. Note: By default, taxes are applied AFTER a fee or a discount on an order. If you’d like to change that, simply toggle the “Pre-Tax” toggle off. Taxes, discounts, and fees may be created in a Catalog to apply at the order level, or within a specific Category to apply at the item level. 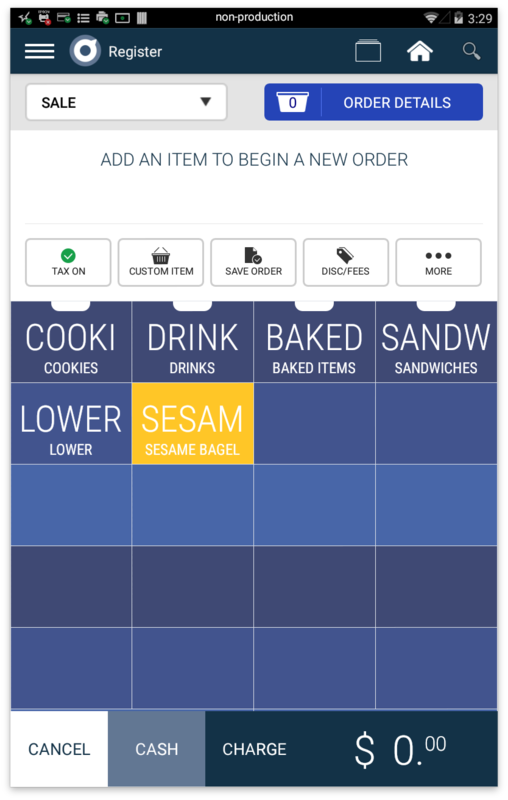 To select their context, simply select “Order” or “Item” from the dropdown. Step 2: Specify a name for your tax under Name. Step 3: Determine if the tax is applied as a Percentage or as a Fixed Amount. Step 4: Set the amount. Step 5: Confirm the Type of tax. Step 2: Specify a name for your discount under Code. Step 3: Determine if the discount is applied as a Percentage or as a Fixed Amount. Step 4: Leave the “Apply before tax calculation” toggle ON to make this discount applicable prior to any taxes on this order. Turn off if you’d like the discount to be applied after the taxes. Step 5: Select the Context of your discount. This determines whether it is applied to the entire order, or to a specific item within a category. Step 6: Select the Catalog this discount should live in. Step 2: Specify a name for your product under Code. Step 3: Determine if the fee is applied as a Percentage or as a Fixed Amount. Step 4: Leave the “Apply before tax calculation” toggle ON to make this fee applicable prior to any taxes on this order. Turn off if you’d like the fee to be applied after the taxes. Step 5: Select the Context of your fee. This determines whether it is applied to the entire order, or to a specific item within a category. Step 6: Select the Catalog this fee should live in. 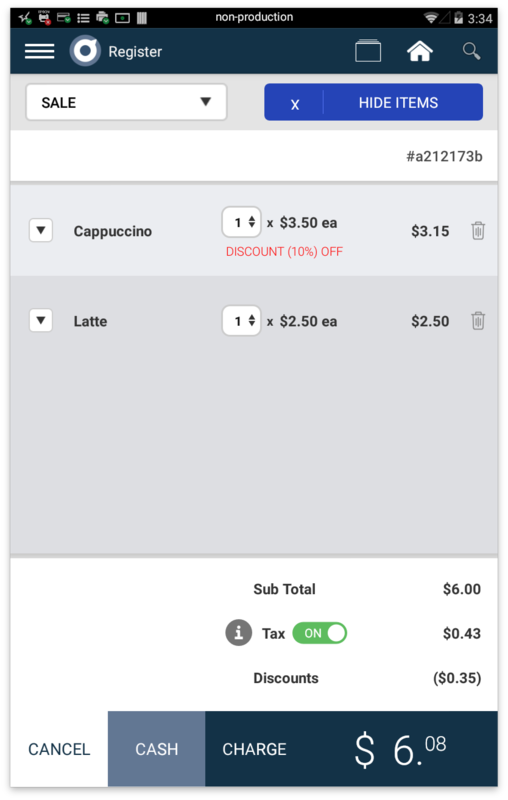 Once you create your fees, discounts, or taxes within Catalog, they will be applicable on the item or order level in the Register app. 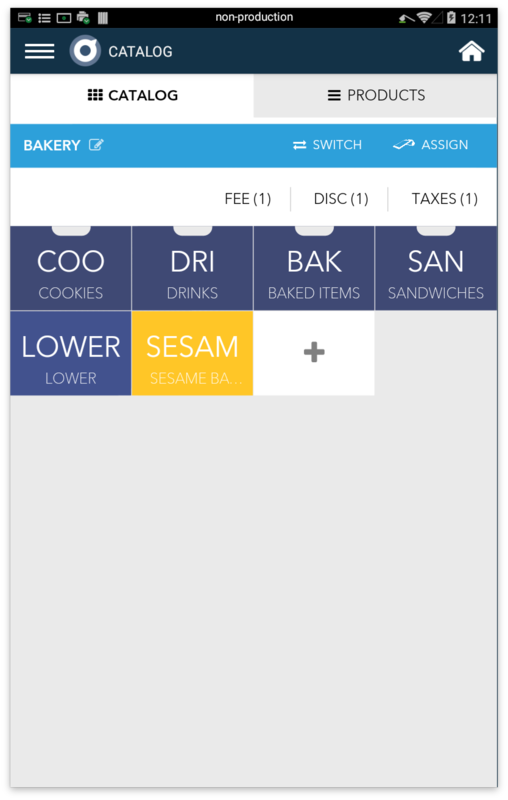 To apply an order level fee or discount, you may select the Disc/Fee button in the Register App. Once you click the Disc/Fee button, you may select existing discounts or fees to apply to the order or create a custom discount or fee. Step 1: In Register app, select the button that says “Disc/Fees”. Step 2: Select the Discount tab on the top. Step 3: Enter the amount. Step 4: By default, the Tax after Discount will be toggled on. If you’d like the discount to apply after tax is applied, toggle OFF this setting. Step 5: Determine whether the custom discount will be a Percentage or $ Amount. Step 6: Once done, select Apply. Step 2: Select the Fee tab on the top. Step 4: By default, the Tax after Fee will be toggled on. If you’d like the fee to apply after tax is applied, toggle OFF this setting. Step 5: Determine whether the custom fee will be a Percentage or $ Amount. Any taxes that you've created may be toggled on or off at the item level here. To apply a fee or discount at the item level, select "Order Details" and click the more options dropdown to the left of the product. When you select Disc/Fee within the dropdown menu, the same Discount and Fee modal will prompt where you can select existing discounts and fees or create a custom one. You'll be able to see the discount or fee within the Order Details just under the item it was applied to.